Meteorologists struggled to find the right words to describe the situation as a line of three hurricanes—two of them major and all of them threatening land—brewed in the Atlantic basin in September 2017. Forecasters were most concerned about Irma, which was on track to make landfall in densely populated South Florida on September 10 as a large category 4 storm. Meanwhile, category 2 Hurricane Katia was headed for Mexico, where it was expected to make landfall on September 9. 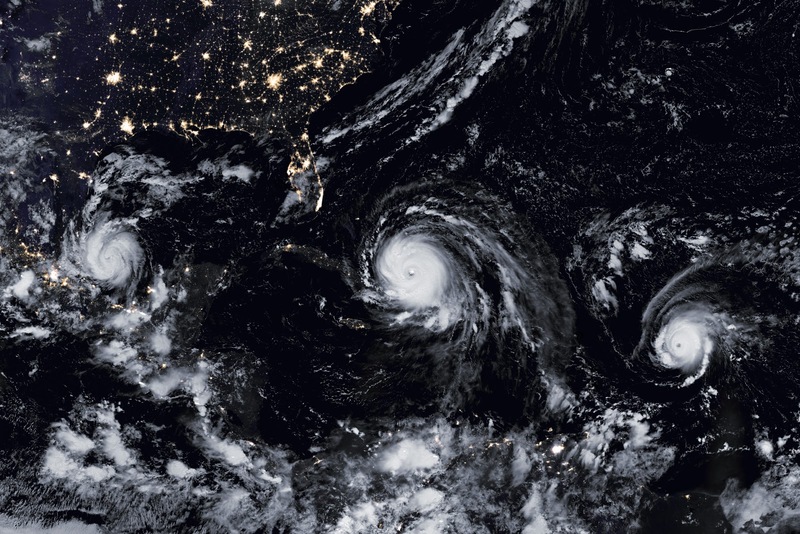 And just days after Irma devastated the Leeward Islands, the chain of small Caribbean islands braced for another blow—this time from category 4 Hurricane Jose. 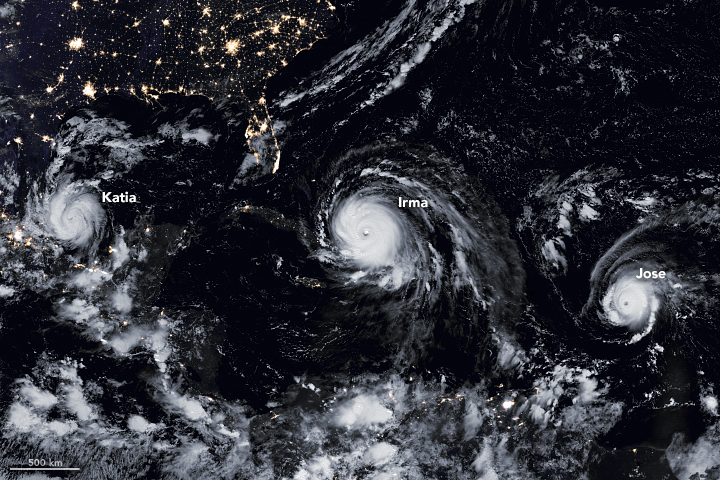 The Visible Infrared Imaging Radiometer Suite (VIIRS) on the Suomi NPP satellite captured the data for a mosaic of Katia, Irma, and Jose as they appeared in the early hours of September 8, 2017. The images were acquired by the VIIRS “day-night band,” which detects light signals in a range of wavelengths from green to near-infrared, and uses filtering techniques to observe signals such as city lights, auroras, wildfires, and reflected moonlight. In this case, the clouds were lit by the nearly full Moon. The image is a composite, showing cloud imagery combined with data on city lights.